Are you ready for the Zombie Apocalypse? Our full sized Large Zombie Garden Gnome is the most terrifying Gnombie ever made! Beware and Caution! Scarying away foes at 20" tall and 14" wide beware those claws and teeth. Made of solid cold form resin and weighing 12 pounds, each Gnombie exterior is hand painted artistry utilizing all weather paints plus multiple outer protectants making him safe from harsh elements, but not from late night poachers. Your neighbors will raise concern about late night brain feasts and missing cats. Part garden gnome, part reanimated dead body, Gnombie is a unique, limited edition collectible display piece. His decay and impressive details are hand painted and air brushed with meticulous care. 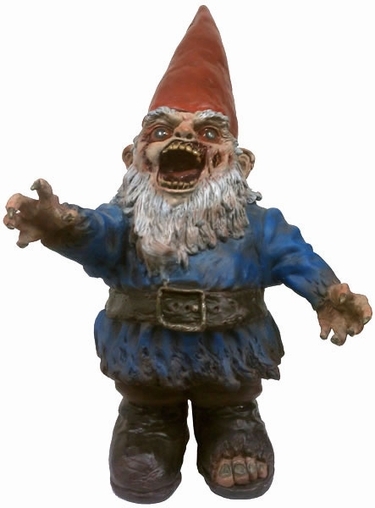 While Gnombie can be easily transported, left outdoors,and photographed in the wild, for best longevity we would recommend displaying him indoors where he is equally terrifying. This is not your average garden gnome. The detail and care put into this zombie garden gnome is literally incredible. From the weight, to the sculpt, to the multicolor packaging, not a single corner has been cut during this garden zombie's production. Each single Gnombie is specifically hand painted with deep intention using a 24 step process and 4 different types of sealant to keep wet parts like the mouth, eyes, and wounds looking wet, and the flat matted parts looking dirty. From the gruesome glassy eyes and shiny teeth, down to the gangronous fungus toe nails, this zombie garden gnome is a serious work of art. Gnombie was originally created for ages 15 and up; he is not a toy and should be displayed for adult use only. Gnombie will arrive to you in a foam cushioned box with a great big warning label on it (see image). Please open the box carefully - Gnombie is horrifying at first sight and should be unpackaged with care. He makes a great gift for the gnome lover that thought they had seen it all, as Halloween Garden Decor, and doubles equally well and evil Santa elves for the holidays! WARNING: Contents undead, do not provoke or poke with sharp objects. Keep away from cats, wine coolers and pinwheels.